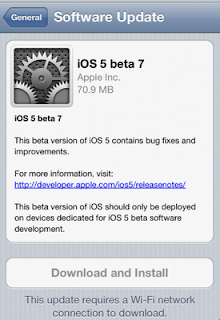 pple has released the iOS 5 beta 7 software update to developers for iPhone 4, iPhone 3GS , iPad and iPod Touch.There is no such details present in this iOS 5 beta update apart from the bug fixes and improvements. However, we will keep informing you if any new features or service get found in this latest iOS 5 update.Like always, this is the pre-release version which only meant for developers. 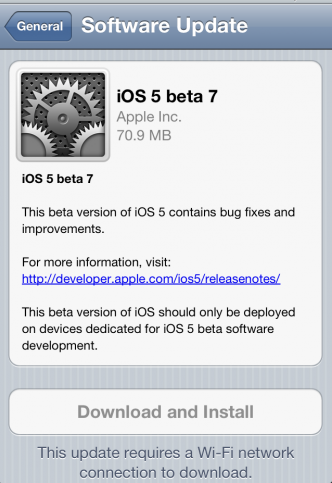 NOTE: Those who already upgraded to the previous iOS 5 beta 6 firmware can easily download iOS 5 Beta 7 via OTA (Over-The-Air) service for free. In addition to iOS 5 Beta 7, Apple has released Xcode 4.2 Developer Preview 7, iTunes 10.5 beta 7, and Apple TV Software beta 6 for compatibility. This beta version of iOS 5 contains bug fixes and improvements. You can download iOS 5 Beta 7 from the Apple’s Developers Portal which does requires you to have a registered Apple Dev-ID (UDID) from here. So if you are one of those who registered up their self in Apple’s Developer Program can easily get the latest iOS 5 beta update by logging in to your account, or by simply checking on your device only if you are running iOS 5 beta 5+. But from all of this, if you still want to get hands on iOS 5 beta 7, here we have managed some direct links. 5 Respones to "iOS 5 Beta 7 IPSW For iPhone, iPad And iPod Touch [ Direct Download]"
This one is really one of most crucial information about iOS 5 beta 7 software. The vital description of this source really enhances my amount of knowledge about it. Is there any problem when I update my iPhone GS? because Apple users told me that if you update your iPhone then your phone will not working. I am afraid now. iOS 5 beta 7 version seems to be cool with great features. It is compatible?